This week both my boys were in camps that started early so I wanted a quick and healthy breakfast for them so we could get out the door on time. 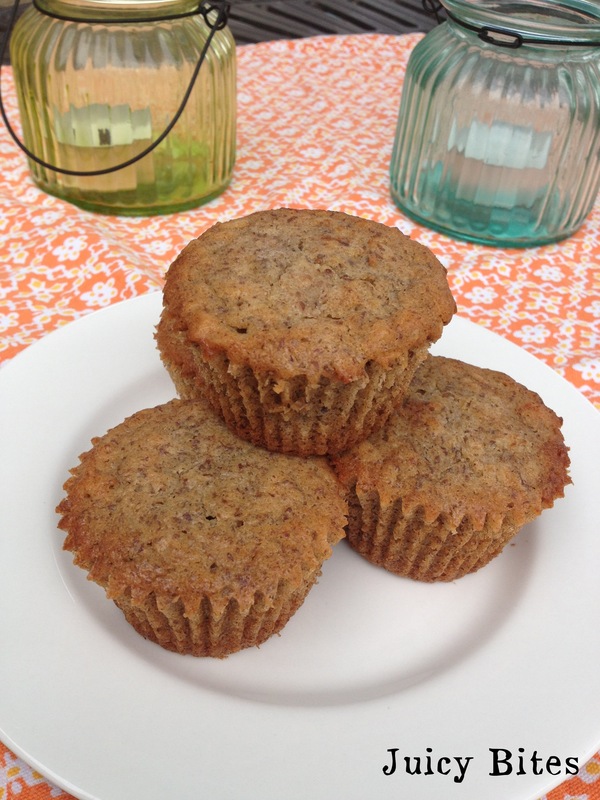 Muffins fit the bill perfectly so I whipped up a batch of these Banana “Surprise” Muffins with the over ripe bananas that I needed to use. 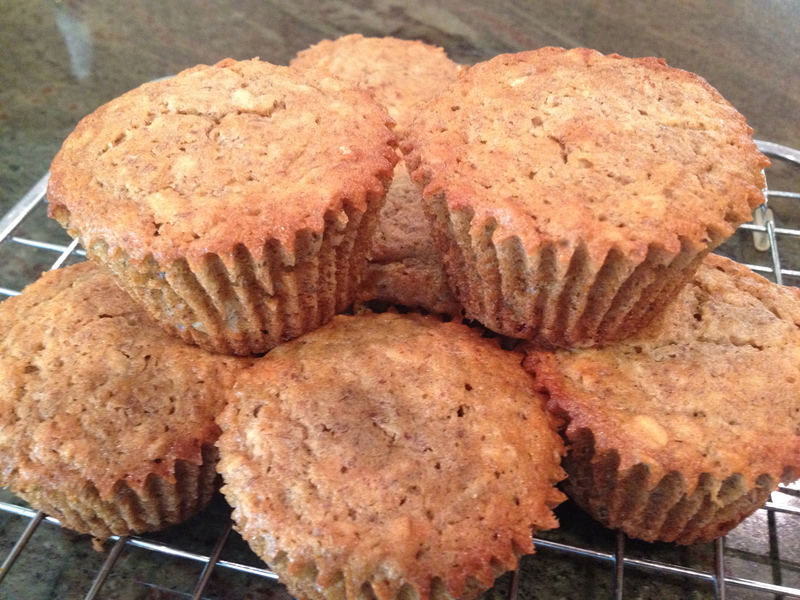 I found a recipe for Banana-Buttermilk and Oat Muffins and tweaked it a little to add some extra health benefits as well as the “surprise” in the center. I added oats, flax, and whole wheat flour to amp up the nutritional benefits. I also subbed coconut oil for the vegetable oil in the recipe. Surprise! 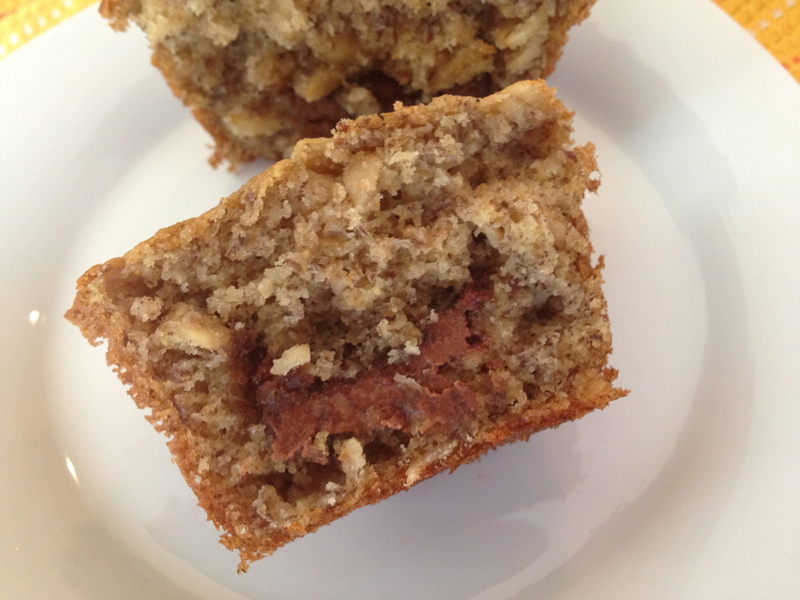 The middle of these muffins have a delicious dollop of my favorite Chocolate Almond Butter. I love all the nut butters from Justin’s, but the chocolate ones are my favorite. They are full of real chocolate flavor without a lot of sugar. 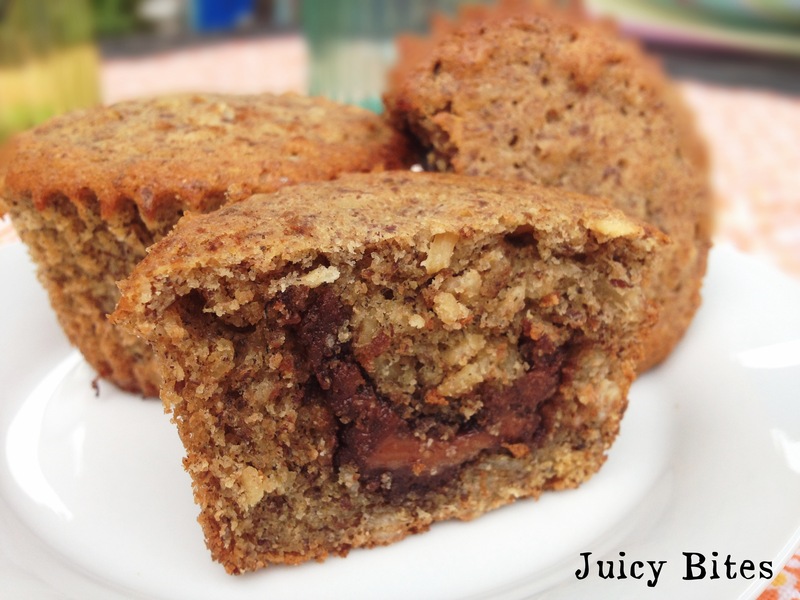 This stuff is good on just about anything, but in the middle of a banana muffin…it’s just dreamy! All I did was fill the muffin cups 1/2 full with batter, then add a spoonful of the chocolate almond butter to the center before filling them up the rest of the way. 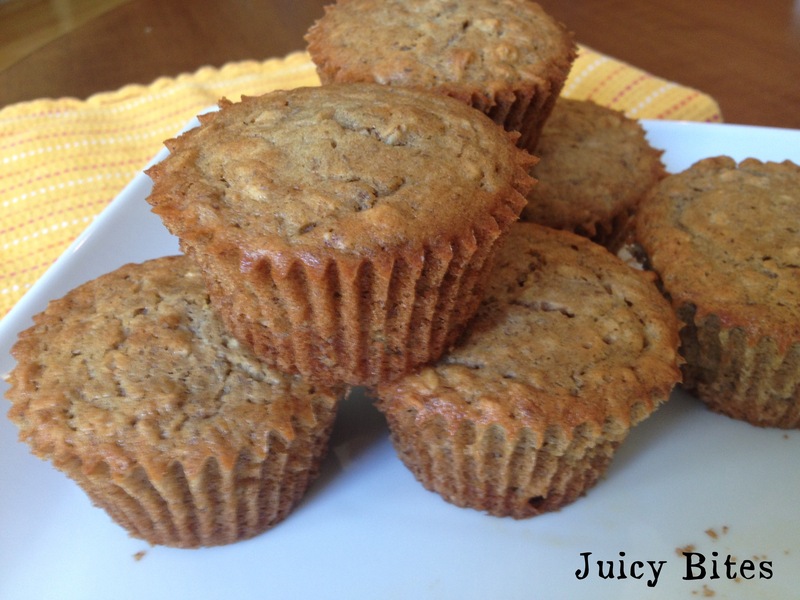 I’m really not much of a baker, but these tasty muffins are very easy to make! So when breakfast time rolled around, I would pop one of these babies in the toaster oven for about 5 minutes which makes them a little warm and extra delicious. One of these with my Tropical Green Smoothie and you have a delicious, quick, and easy breakfast. My boys really loved these and are asking when I will be making the next batch. *Note: If you use coconut oil, you may need to heat it up under warm water or in the microwave depending on the temperature. Coconut oil is solid at room temp, but mine was liquid due to some warm weather we were having. You also need to have your buttermilk and egg at room temp so that the coconut oil doesn’t solidify when you mix the wet ingredients together. Preheat oven to 400 F and line your 12 cup muffin pan. In a small bowl, mix the dry ingredients together. In a large bowl, whisk or beat the wet ingredients together. Gradually mix the dry ingredients into the wet ingredients and stop as soon as you see the last bit of flour disappear. Do not over mix. 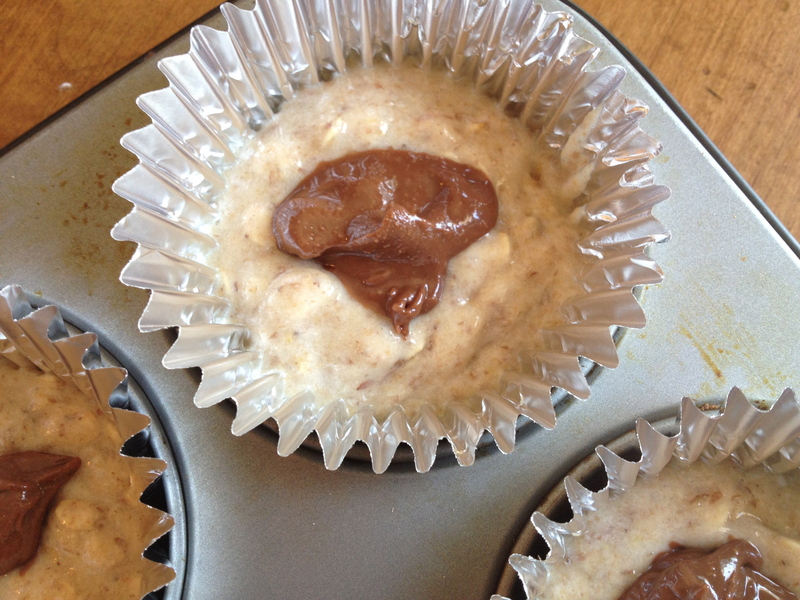 Fill muffin cups 1/4 full with batter. Next add a teaspoon full (or more!) 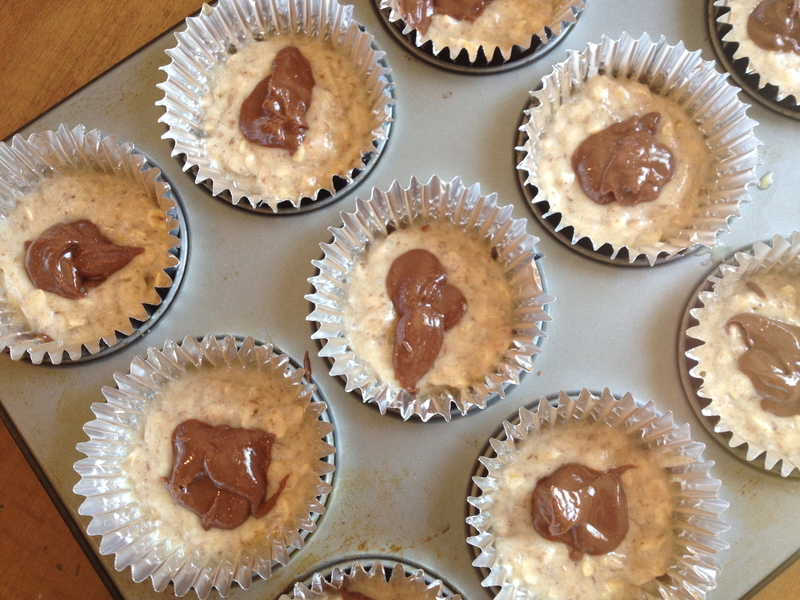 of chocolate nut butter, then add the remaining batter on top. Bake for 18 minutes until the tops are golden brown. Cool in tin for 5 minutes and then leave them to cool completely on a wire rack. Enjoy! Looks yummy! I can’t wait to try.